Slowly the lessons of micro lending are been applied to agriculture as they should be. The potential happens to be huge and can certainly massively expand agricultural output. I have already posted on a range of such protocols and that includes the application of modern high rise housing to the farm environment. What has been poorly understood in the application of industrial farming is that the dollar productivity on a per acre basis is low. We are focused on commodity crops rather than value added crops requiring Human input. Yet independent human input needs access to capital in order to develop the profit stream. Land is often the least of it when is is possible for five acres to produce as much as a full square mile of land along with all the equipment. This may be extreme, but it is also not an outlier either. 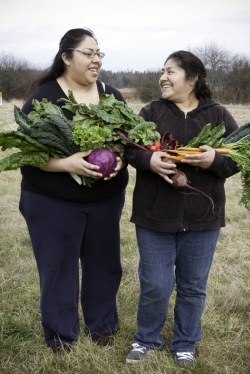 Martinez started selling vegetables from her community garden to help pay for her son’s treatment (he has since recovered), and then got hooked up withViva Farms, a farm incubator program in Washington state’s Skagit Valley that helped her access land she could farm as if it were her own. Now, Martinez has a three-acre plot there, leases another two acres elsewhere, and sells more than 70 types of organic vegetables at a farmers market, where she also makes fresh tortillas and sells Oaxacan-style tacos. Martinez wants to expand her business, but access to credit or capital isn’t easy to get if you’re not established. That’s exactly why she was chosen to participate in a new microloan program designed to help small and beginning farmers. Martinez is one of the first two bootstrappers to receive funding from the Farmer Reserve Fund, a project launched jointly by Viva Farms, Slow Money NW, and a local credit union. She has received $2,000 to use primarily for buying seeds and vegetable boxes. “The loan allows me to have more cash throughout the season while I wait to harvest my crops,” she says. This program is an early example of something that could catch on around the country and make a difference not only for participating farmers and their families, but also for our nation’s food system. In the recent past, microloans have often been used to help start or expand businesses in developing countries, but the concept is now taking off in the U.S. The U.S. Department of Agriculture even proposed a microloan program for small farmers this spring. Between that, the Farmer Reserve Fund, and other programs that have sprouted up like it, this could be the next step for microloans, and a promising future for beginning farmers in the U.S.
Once a farm gets to be a certain size, farmers have a relatively easy time accessing credit. “There are more government programs and [grants] for you once you’re on a more solid footing,” says Ethan Schaffer, Viva Farms’ director of business and organizational development. And, even when they’re just starting out, hipster farmerstend to have access to family loans and low-interest credit cards. But many young farmers — particularly Latino farmers — don’t have those options. So, says Japhet Koteen, the Farmer Reserve Fund’s project manager, they usually resort to high-interest credit. “Then they’re trying to run a business with a 20 percent interest credit card,” he says, which is not the best idea. That’s why Viva Farms screens and selects Farmer Reserve Fund applicants, Koteen explains. They know the local farming community best and can help farmers access loans based on more than just their credit history. In other words, the personal and professional relationships are key. Viva Farms works with farmers to develop business plans and requires on-farm education, with a focus on financial literacy. Then the course instructors for those programs will recommend a dollar amount for the loan to the bank. The Fund makes loans of between $1,000 and $10,000 — amounts too small for most financial institutions to bother with — for farmers with between two and 10 acres of land. “We found that that’s where the largest gap is at the moment: that earlier stage, for smaller amounts of money,” says Schaffer. Koteen expects the program to expand to other parts of Washington within the next couple of months, and he thinks it’s replicable far beyond that, as well. “There are other entities like Viva Farms who know there’s a need and have existing relationships with these farmers,” he says. Santiago Lozano, a strawberry farmer who was chosen alongside Martinez in the first round of loans, is excited about having $5,000 to spend on strengthening his business. For one, he can now pay his workers before the harvest is sold — something he wasn’t able to do last year. It also helps him aim high and dream big.